Bon Voyage Messages: A goodbye quote should be sweet and inspirational. It should embody the meaning of wanderlust. It should be the perfect way to kick start a travel journey. Think about how you are going to use words that make for the perfect farewell message. Whether it is for friends, colleagues, boyfriend, girlfriend, husband, wife, boss or anyone else – make sure your wishes bring a smile on their faces. Start cute countdowns on Facebook and share inspiring stuff on Pinterest and Instagram. Build up the enthusiasm so that they’re happy and pumped up when it is time to fly away. Whether it is for a short holiday, business tour or a long vacation – take ideas from this post to dig deep in your soul to find the right thing to say when you have your last hug. 1) Life is a journey. Don’t imprison yourself in a rut. Break free and travel. Wander as if you’re lost. It’s the only way to discover yourself. Bon voyage. 2) Life isn’t meant to be lived caged within walls and mindsets. The only way to break free from the shackles of monotony is to travel. Bon voyage. 3) Traveling is an expense which yields great returns in the form of priceless memories and enlightening experiences. Bon voyage. 4) Traveling isn’t only about hopping to different places and new cities. It’s also about soaking in new cultures and faces. Bon voyage. 5) Traveling is less about selfies, more about memories. Bon voyage. 6) I’ll miss you until you come back but I hope you’ll make up for it by getting me awesome gifts. Bon voyage. 7) Don’t worry about souvenirs… fill your bags with experiences and memories when you return. Bon voyage. 8) The wings of your airplane may be big, but the ones of your mind are bigger. Bon voyage. 9) Get lost, run out of money and do crazy things – these are the memories from your travels that will last a lifetime. Bon voyage. 10) Open your senses, feed your soul. Be carefree and let wanderlust take control. Bon voyage. 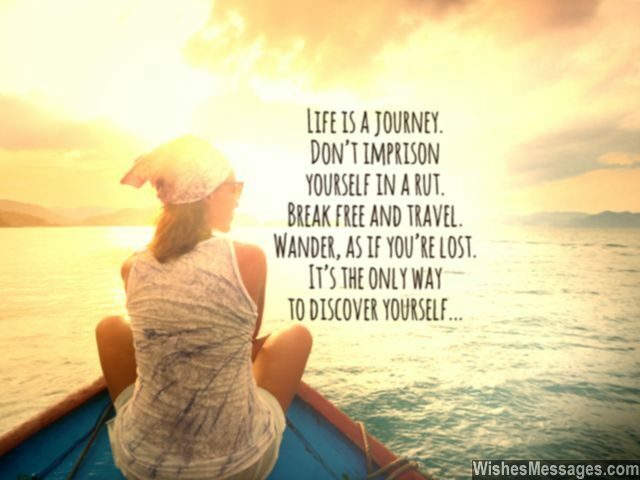 11) Wanderlust isn’t about running away. 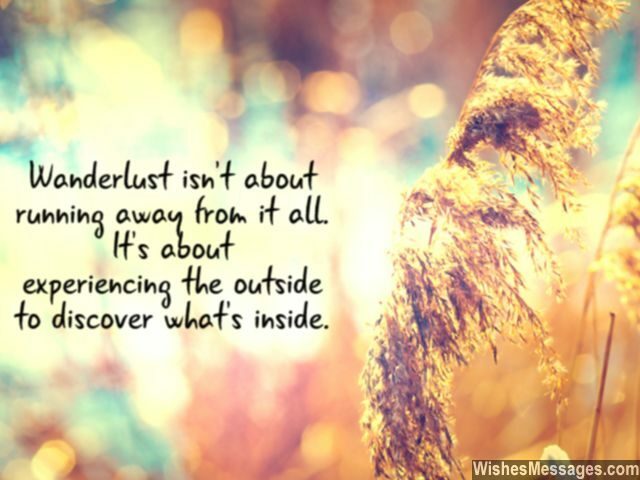 It’s about experiencing the outside to discover what’s inside. Goodbye my friend, bon voyage. 12) Travel as if your life depends on it. Because decades later, the happiness in your life will actually depend on reflecting on the memories that you make today. Bon voyage. 13) Beautiful and rare sights in this world are many, but beautiful travelers like you are few. Bon voyage sweetheart. 14) The memories of traveling form some of the most fascinating chapters in your life’ book. Bon voyage. 15) Some people say traveling makes you wise. Some people say traveling makes you humble. I say, don’t think and just travel. Bon voyage. 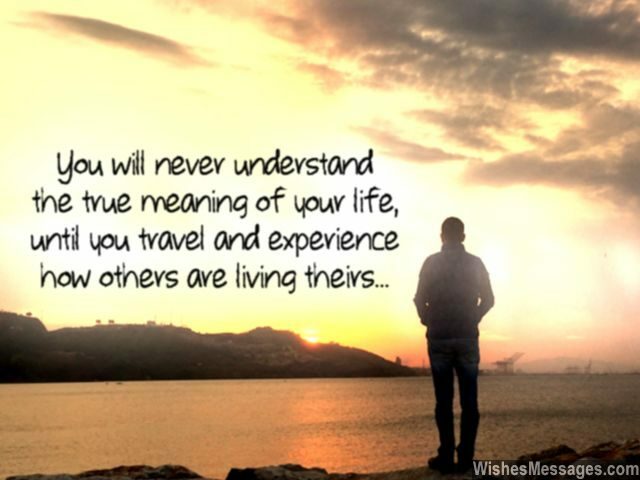 16) You will never understand the true meaning of your life, until you travel and experience how others are living theirs. Bon voyage. 17) This beautiful world is God’s handmade collage… and for your travels I wish you bon voyage. 18) The secret to really enjoying a holiday lies in switching off your cell phone and staying away from Facebook, Email, Twitter and Instagram. Bon voyage. 19) May your travels cure the biggest worries of your life, I wish a happy journey to you and your wife. Bon voyage. 20) No matter how important a business trip, it always begins with a hug from someone who cares about you. Bon voyage, xoxo. 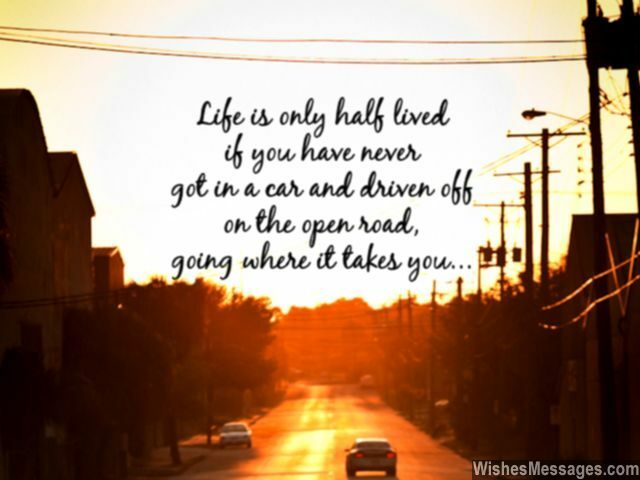 21) Life is only half lived if you have never got in a car and driven off on the open road. Bon voyage and have an awesome road trip. 22) Discover, find, seek, search, rummage, explore, visit, unearth – if you like the sound of these words, I bet you will enjoy your holiday. Bon voyage. 23) Traveling isn’t about looking and watching, it’s about feeling and experiencing. Bon voyage. 24) Sometimes, wandering and traveling aimlessly helps you introspect and zero in on your life’s real aims. Bon voyage. 25) The money you spend on your travels is actually an investment that will help you grow from within. Bon voyage. 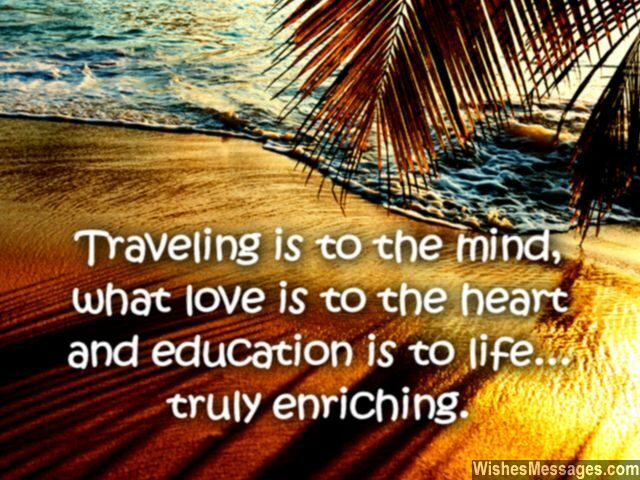 26) Traveling is to the mind, what love is to the heart and education is to life… truly enriching. Bon voyage. 27) May you discover beautiful things, as you fly across the world on a plane with wings. May you have experiences that change your thinking, as you trot across to far of lands while traveling. Bon voyage. 28) Life is not about the number of destinations you have seen, but the number of journeys you have experienced. Bon voyage. 29) I wish I was your GoPro – then I would travel the world with you. Bon voyage. 30) Capture every landscape in you new iPhone’s panoramic view, for unfortunate ones like us whose holidays are long due. Bon voyage. 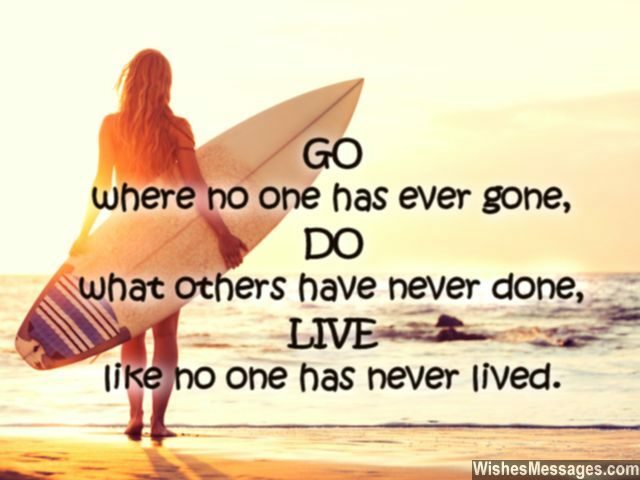 31) Go where no one has ever gone, do what others have never done, live like others have never lived. Bon voyage. 32) You are lucky to be able to travel so much for business, I am a little jealous of you, I confess. I wish you not just success, but also tons of happiness. Bon voyage. 33) Life’s meaning doesn’t lie simply in promotions and pay checks. It also lies in crossing boundaries, experiencing new cultures and understanding the world in a better way. Bon voyage. 34) Like your own life, may this journey be full of surprises and fun. Bon voyage. 35) As you pack your bags and leave for your holiday, I hope that you never get lost along the way. Bon voyage. 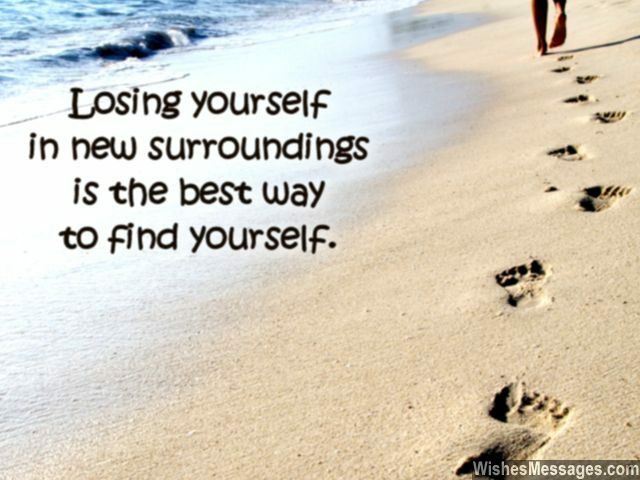 36) Losing yourself in new surroundings is the best way to find yourself. Bon voyage. 37) I know that your business trip is just an excuse, actually you just want to go there to enjoy the cruise. Bon voyage. 38) When you travel with loved ones, it doesn’t matter where you are going – because every place will envelope you with love and happiness. Bon voyage and enjoy your family vacation. 39) We will desperately wait for your photographs, but more so for the souvenirs you get us. Bon voyage. 40) The only way to make your travels fantastic, is to nurture an undying penchant for the exotic. Bon voyage.